NPV: popularly known as Net present value. This is the difference between the present value of cash inflows and cash outflows. · If you are investing in certain investments or projects if it produces positive NPV or NPV>0 then you can accept that project. · And in case of negative NPV or NPV<0, you should not accept the project. 1. It helps you to maximize your wealth as it will show your returns greater than its cost of capital or not. 2.It takes into consideration both before & after cash flow over the life span of a project. 3. It considers all discount rates that may exist at different point of time while discounting back our cashflows. 1.Calculating Appropriate discount rate is difficult. 2.It will not give accurate decision if two or more projects are of unequal life. 3. It doesn’t provide accurate answer at what period of time you will achieve positive NPV. IRR: also referred as “yield to redemption or yield per annum. The internal rate of return for an investment project is the effective rate of interest that equates the present value of inflows and outflows. Higher IRR represents a more profitable project. However, IRR need not be positive. Zero return implies investor receives no return on investment. If the project has only cash inflows then the IRR is infinity. 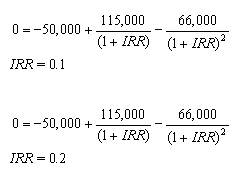 When IRR< cost of capital, NPV will be negative. 1.This approach is mostly used by financial managers as it is expressed in percentage form so it is easy for them to compare to the required cost of capital. 2. IRR method gives you the advantage of knowing the actual returns of the money which you invested today. 1.If an analyst is evaluating two projects, both of which share a common discount rate, predictable cash flows, equal risk, and a shorter time horizon, IRR will probably work. The catch is that discount rates usually change substantially over time. Thus, IRR will not be effective. 2. IRR is the discount rate that makes a project break even. If market conditions change over the years, this project can have two or more IRR. (we will justify with the example). We have seen the advantages and disadvantages of both the methods. 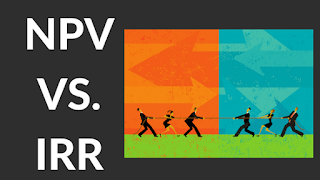 But NPV is much better as compared to IRR. 1. IRR assumes the single discount rate which will not be case in reality. For example, return on 1- year Treasury bills is varied between 1% - 12% in last 20 years. Now this problem is easily solved by NPV method as it discounts back the future cashflows at different discount rates easily. 3. IRR can be negative too which is difficult to interpret, whereas in case of NPV if it is negative it surely means Deficit and positive implies profitability in the project. 4.Positive NPV indicates addition to shareholder’s wealth and negative NPV implies vice-versa. But this thumb rule will not applicable in case of IRR. So, why is the IRR method still commonly used in capital budgeting? Its because of its reporting simplicity. 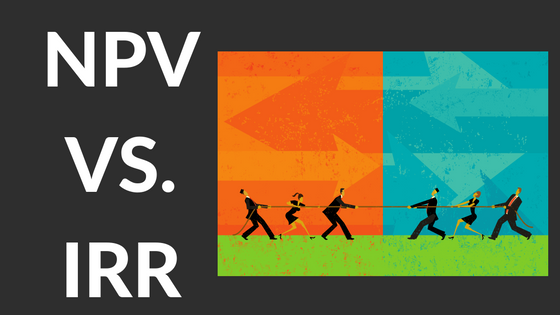 The NPV method is inherently complex and requires assumptions at each stage. The result is simple, but for any project that is long-term, that has multiple cash flows at different discount rates, or that has uncertain cash flows - in fact, for almost any project at all - simple IRR isn't good for much more than presentation value.